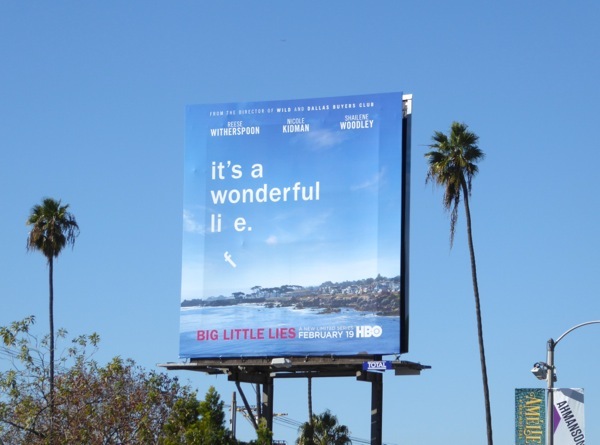 At this time of year Daily Billboard is sure more than a few of you are watching the 1946 Christmas movie It's a Wonderful Life to get you in the festive spirit, and that's why this ad campaign for HBO's new limited series, Big Little Lies, really catches your eye. 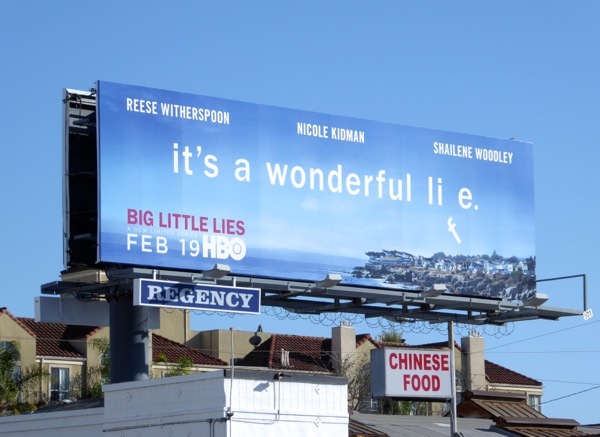 The falling 'f' in 'life', making the tagline 'it's a wonderful lie', cleverly hints at the type of drama this limited series with Reese Witherspoon, Nicole Kidman and Shailene Woodley will be. 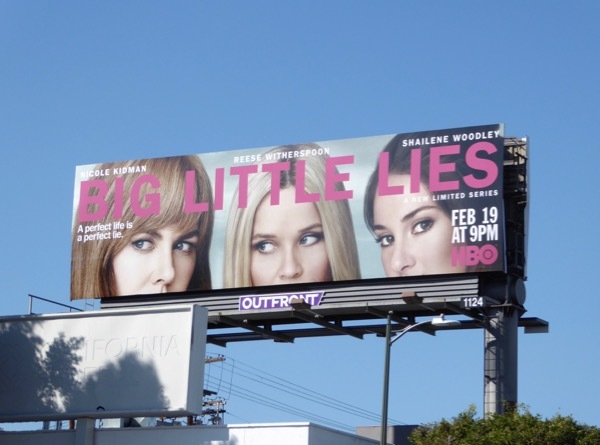 The show with these three leading ladies explores the darker comedic side of marriage, motherhood and murder, and tells the tale of three mothers who apparently don't lead such perfect lives as they'd like us to believe. 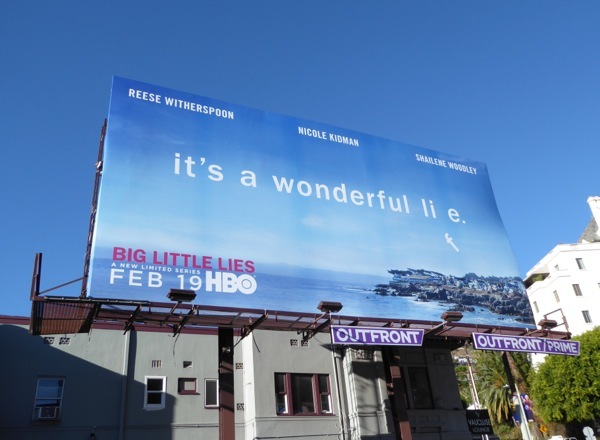 These intriguing series launch billboards were snapped along the Sunset Strip and 3rd Street from December 14 to December 17, 2016. 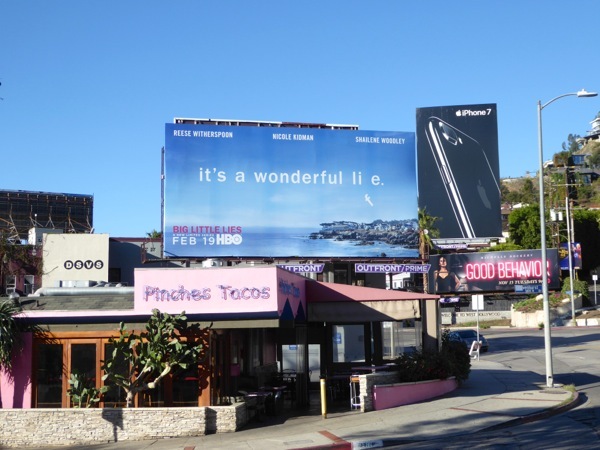 Fans of Reese Witherspoon can also check the actress out in these Hot Pursuit movie billboards and these This Means War film billboards, admirers of Nicole Kidman can enjoy these Jimmy Choo fashion billboards and this Hemingway & Gellhorn movie billboard, whilst for more of Shailene Woodley, be sure to check out these billboards for the Divergent film franchise. 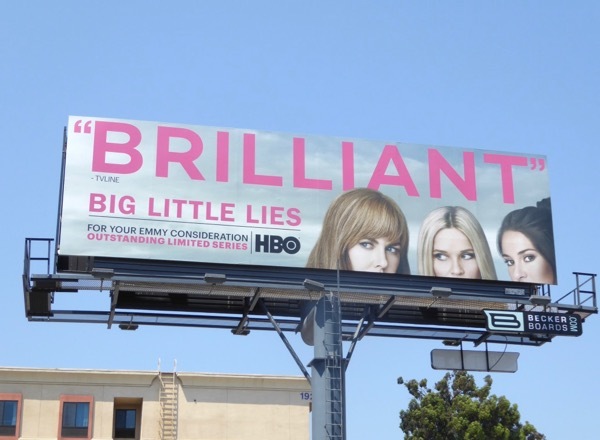 With this much star power in one limited series we'd be lying if we didn't think this would be must-see TV viewing for the New Year, let's just hope we won't need an angel to show us an alternate life where this series didn't exist. 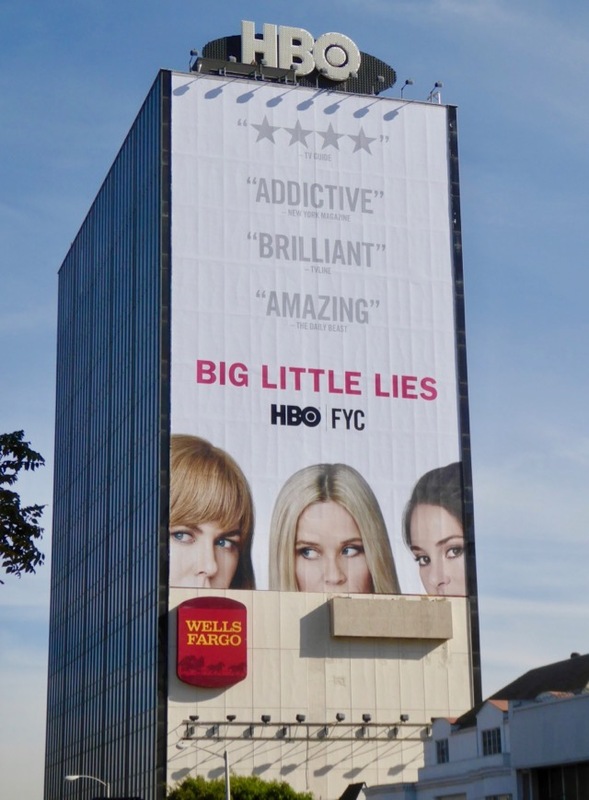 UPDATED: Here's another ad format for the HBO series snapped along Pico Boulevard on December 20, 2016. 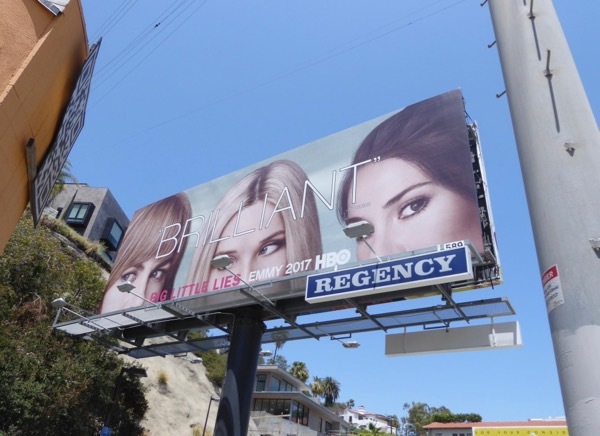 UPDATED: After being teased before Christmas with the shoreline ad creative, Big Little Lies shows off its cast of familiar faces (well half of their faces anyway) with a second wave of billboards for the limited series. 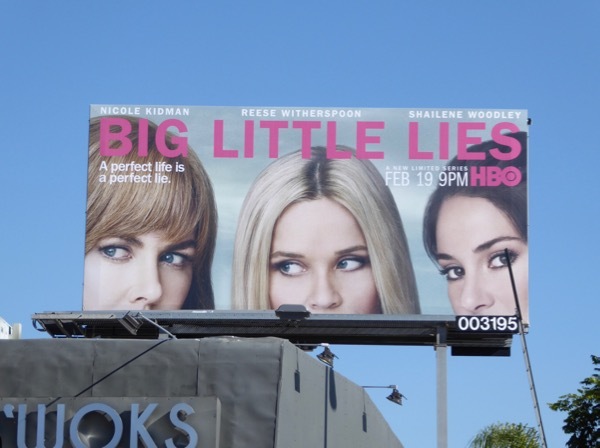 These landscape format billboards with Nicole Kidman, Reese Witherspoon and Shailene Woodley all looking a little guilty and suspicious were snapped along L.A.'s Pico Boulevard on January 25, 2017. 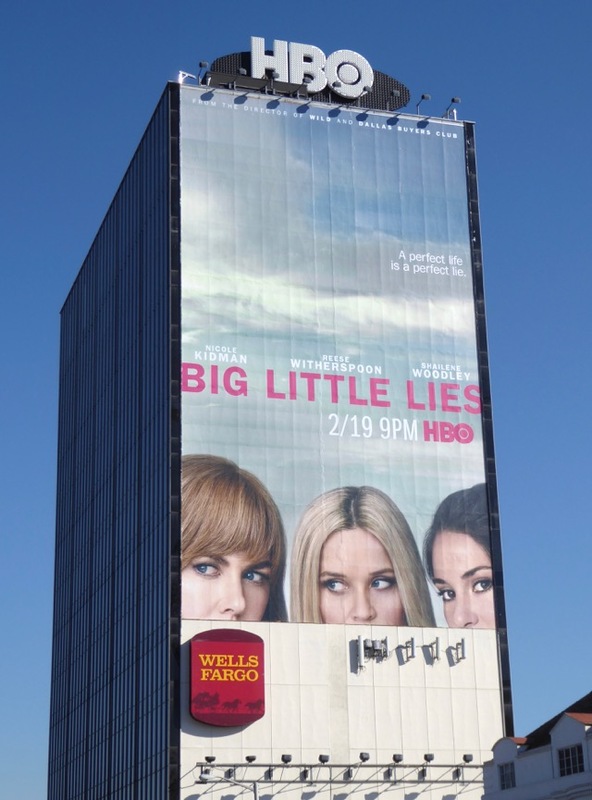 Meanwhile the giant-sized version was captured towering over eastbound traffic along West Hollywood's busy Sunset Strip the same day. 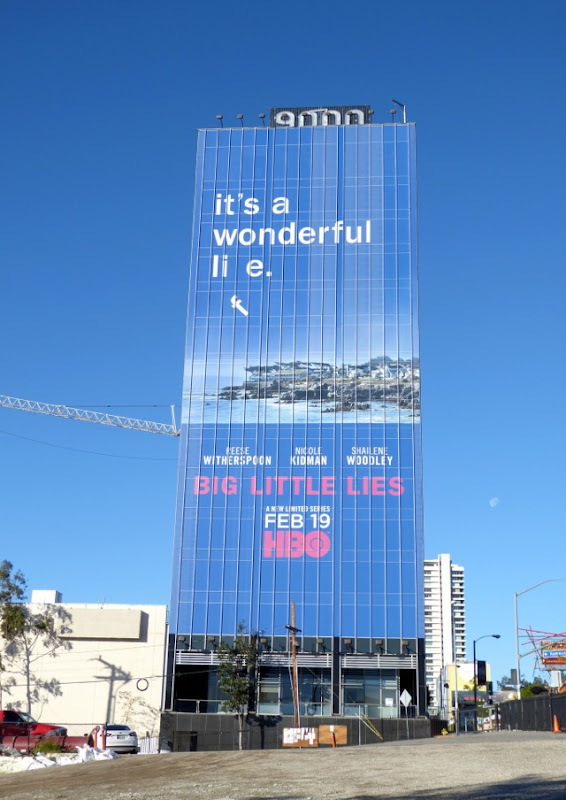 For more examples of this style of ad creative, make sure you also check out these Olive Kitteridge TV billboards, these Better Call Saul Emmy 2015 billboards and these Ellen season eleven TV billboards. 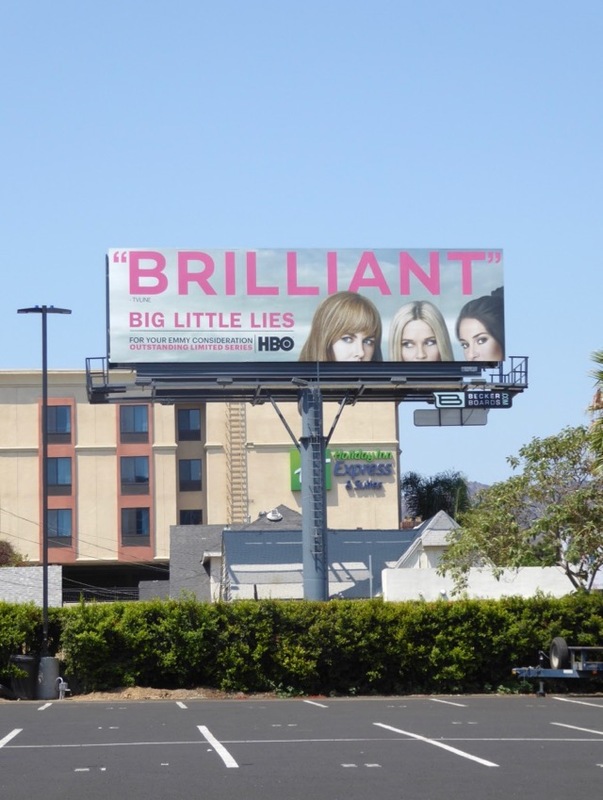 UPDATED: Here's also the Emmy consideration billboard for the 'Brilliant' drama series snapped along the Sunset Strip on June 2, 2017. 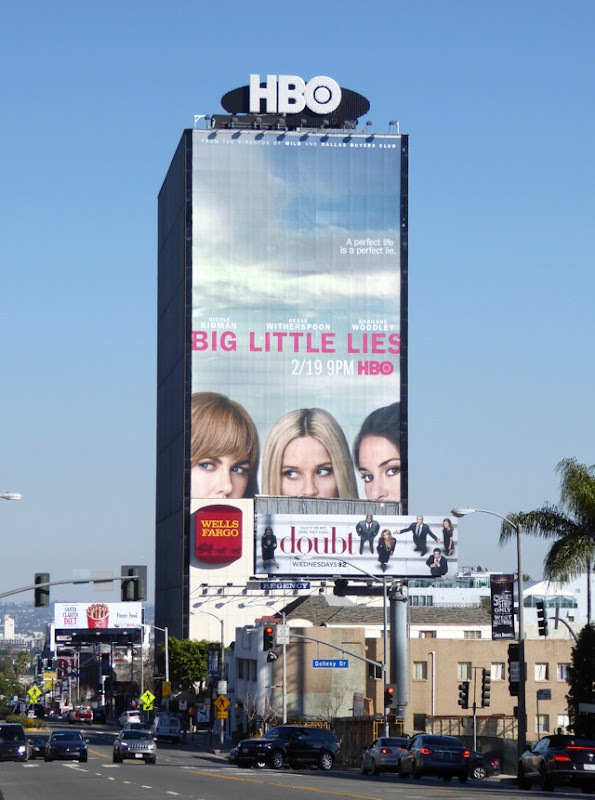 UPDATED: Big Little Lies certainly struck a chord with Television Academy voters, garnering sixteen Emmy nominations for the limited series, including acting nods for Nicole Kidman, Reese Witherspoon, Shailene Woodley, Laura Dern and Alexander Skarsgård. 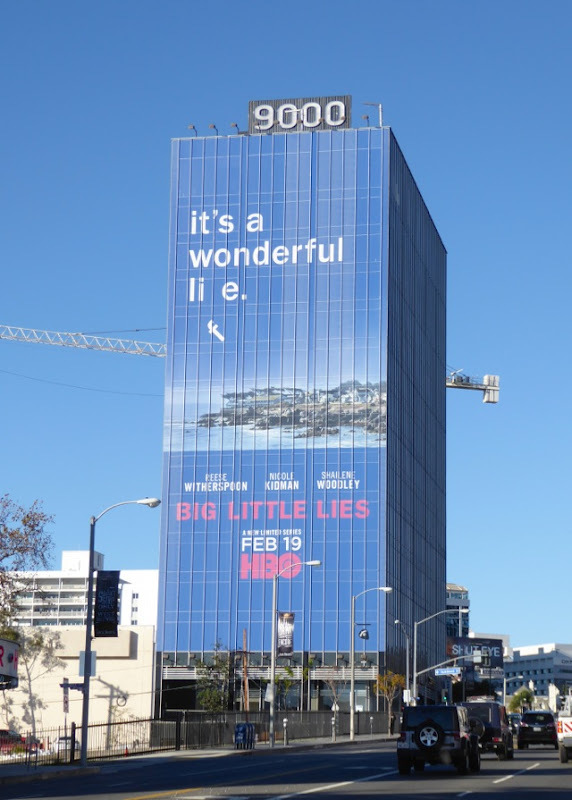 This revamped HBO Emmy nominations billboard was spied standing out in the Hollywood skyline along Highland Avenue on August 5, 2017. 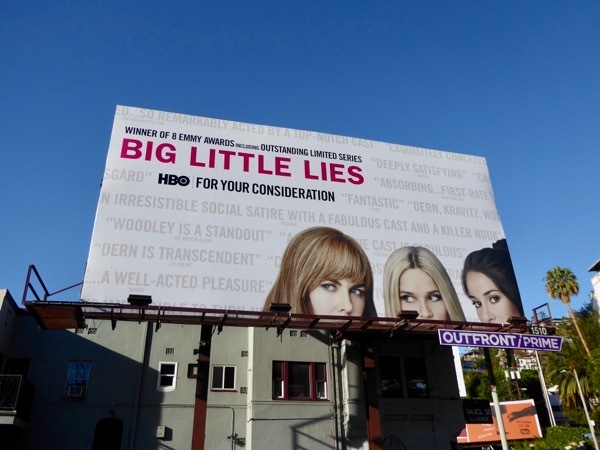 UPDATED: A few months and eight Emmy wins later, it's time to see if Big Little Lies can scoop a Golden Globe, SAG Award or Critics' Choice Award this industry awards season. 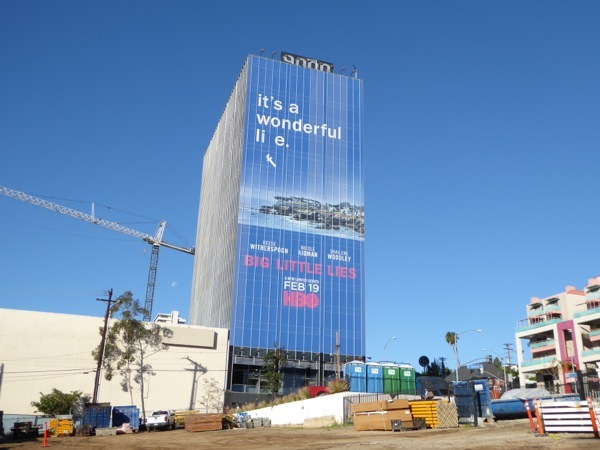 Maybe this giant-sized 'For your consideration' billboard snapped eastbound along the Sunset Strip on November 28, 2017, will help. 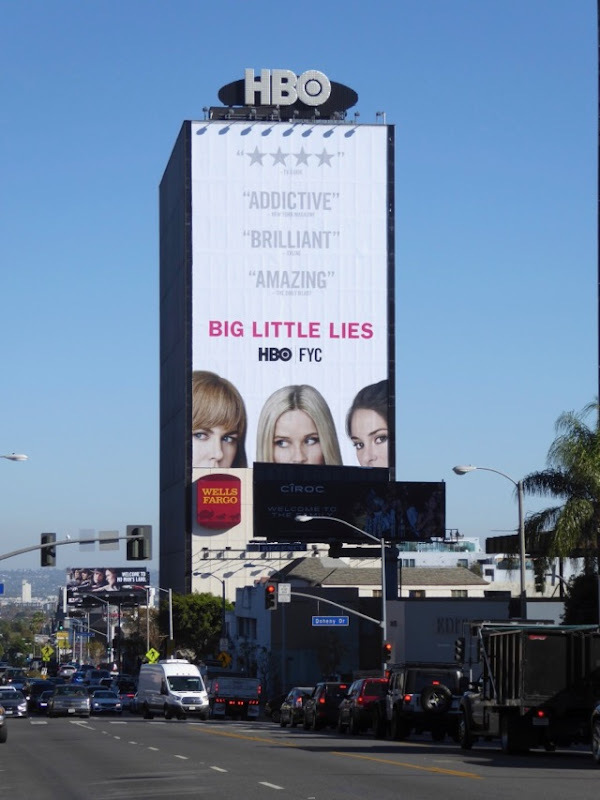 And this landscape FYC version spotted the next day further east along Sunset Boulevard. 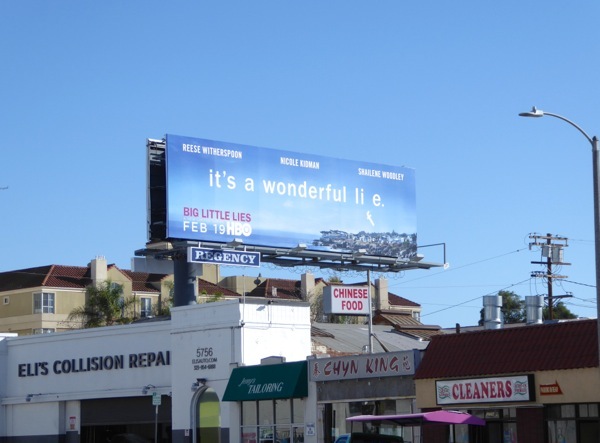 Plus here's the super-sized awards campaign billboard on a clearer December 1, 2017.